I know I can be picky about my YA, but when I discovered this book recently, I just couldn’t resist adding it to my TBR. I’ve always enjoyed seeing phoenixes in fiction, but they always seem to be peripheral to the story even when they are featured. In this case though, they seem pretty central to everything that’s happening. And there’s a girl-disguised-as-a-boy plot! That cover too, is to die for. I just hope this one turns out as good as it sounds. Beautiful cover. And I’m not sure I’ve ever read a phoenix story! I’ll have to keep an eye on this one. I know, I’m simply in love with that cover. Ooh nice! Just starting to see this one around the blogosphere! Loving the cover! Hope you thoroughly enjoy this one once you get to read it! That is such a stunning cover! Yeah, I’m crossing my fingers it’ll be good! 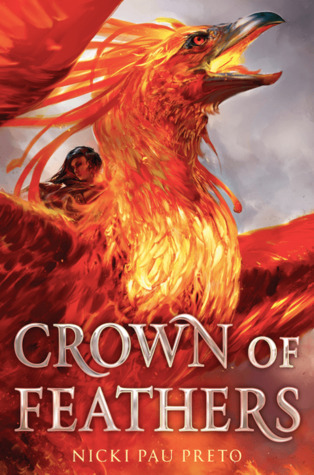 This sounds like a solid read and Cass, the bird lover, definitely approves of the cover! Haha, I know, right? Stuff like that always makes wonder. OMG!!!! This cover is simply fabulous!!! This book sounds freaking amazing!!! Everything about it seems super cool and the cover is gorgeous! Adding it to my TBR! PHOENIX RIDER! Okay, take my money. Huh, I don’t think I’ve ever come across a story with phoenix mounts. This looks really cool and that cover is pretty brilliant! My giddy aunt – that cover. I want this book. The description. Phoenix riders – stop. Added this one to the plunder list! Arrr! Oh… my… Wow. I really, really hope it’s as good as it promises to be.